Luton Muslim website promotes Jihad -forms group to 'liason' with police to "combat factors leading to arrest and detainment of Muslims"
MIM: Metropolitan police chief Ian Blair has already earned the dubious distinction of being included in Dr. Daniel Pipe's website section called "Idiot's File" and it looks like he may be the first person to merit being cited twice, with his latest call for a "compassionate" and "reasonable" debate about terror. The police chief has is politely asking the public "what kind of police they want" and admitted that the police are in the throes of a major identity crisis. (It should be noted that the head of the London police , Tariq Ghaffour, is himself Muslim, who was recently knighted by the Queen).This, and the fact that the most vocal sector of the population criticising law enforcement, have been Muslims, indicates that the absurd call for public input on what the police should do to fight terrorism, will ultimately become a 'dialouge' about law enforcement can appease the Muslim community, who have claimed they were the main victims of the London bombings(!). Even more outrageous is that the Muslim community not only complains about law enforcement scrutiny in the aftermath of terrorist attacks by their bretheren, they add insult to injury by publicly defending the rights of terrrorists in their community. A case in point is the way in which the Luton Muslim community ( Luton was home to several suicide bombers, and one of the largest bases of Al Muhajiroun) is now campaigning for the release of Ahmed Babar, a 'local lad' who is being extradited to the US on charges of planning attacks on a naval instellation and supporting terrorism by recuiting people, collecting provisions, and scouting out a possible terror training camp location in Arizona. Barbar is also accused of involvement in Al Qaeda terrorist websites. The Luton Muslims intensive "Free Ahmad Babar" campaign on their website, have recently announced the Muslim Community Liason Unit which "liason with the police and local government" to "combat factors which lead to hate crimes, unfair arrests and detainment of Muslims".Seeing as that the radical Islamist Luton Muslim community encourages Jihad on their website, it stands to reason that they consider any arrest of a Muslim for terrorism to be a hate crime, making by extension any arrest 'and jailing unfair' . "One possible explanation for why Luton has spawned so many suicide terrorists, may have to do with the community website, which includes such inspiring entries as : 'Dying to Live or Living to Die?!' , 'Lowest Rank in Paradise', 'Party of Paradise or Hellfire?' and 'Punishments in Jahannum'. (For more on this see below). A "compassionate" and "reasonable" debate on policing is needed in the wake of the 7 July bombings, Britain's top policeman is expected to say. Metropolitan Police chief Sir Ian Blair will use the annual Dimbleby lecture to argue the public needs to decide what kind of police it wants. Without such guidance, police are being left to develop policies such as shoot-to-kill in private, he warned. 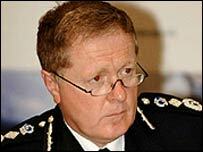 Making his first public comments since the government's failed bid to extend the time terror suspects could be held without charge to 90 days, Sir Ian voiced "frustration" at the public "silence" on what it wanted the police to do. He said police work was being hampered by the lack of a proper examination of what they were for - whether it was to fight crime or fight its causes, to build stronger communities or enforce zero tolerance. If the public did not decide what kind of force it wanted, then the police would drift into deciding on their own, which would not be "right", he added. And he criticised politicians for limiting debate to police numbers and calls for "bobbies on the beat". Meanwhile, the force was "restless for change" and he wanted to "get on with it", he said. Sir Ian said the police, traditionally a "silent and separate" organisation, was finding itself at the heart of political rows without any intervening public debate. He cited the controversies over the Metropolitan Police's shoot-to-kill policy in the wake of the London attacks and the shooting by police of Brazilian Jean Charles de Menezes. Police had also found themselves in the spotlight over their involvement in attempting to persuade MPs to back the government's bid to allow terror suspects to be held without charge for 90 days. He said there should be more parliamentary debate about policing and suggested encouraging the further education sector to provide courses on policing. And he said neighbourhood policing would be key to reform. He added that Britain had too many police forces and warned a single unified police structure for London at least had to be in place before the Olympics in 2012 to enable it to police the event properly. MIM: Note that the press release issued by the family of Barbar Ahmad, who is being extradited to the US on terrorism charges is one of many items which are to be found on the Luton Muslim Community website, which shows that supporting terrorism is part and parcel of their 'religious' agenda and shows that mosques and Islamic Centers have crossed the line into politics and propaganda, which begs the question as to when law enforcement and the government will take measures to shut them down or fine them for abusing their presumably task exempt status as a religious organisation. Ahmad's family are members of the Luton Muslim community and their press release decrying the extradition decision contains many of the phrases used by the Luton Muslims Liason Unit which aims to work with the police' to prevent the arrest and detention of Muslims. The irony and absurdity of this claim is further borne out by the fact that Muslims like those in Luton, who adhere to fundamentalist Islam, (as attested to by the Jihadist content of their website),do not recognise the British government and courts as legitimate. The publicity campaign to fight Ahmed's extradition is another example of a propaganda war designed to label make the UK and America anti Muslim at every media opportunity, and also deplete 'infidels' resources and energy, since the legal bill is being footed by the taxpayers. More proof of the Luton Muslims Islamo facist weltaanshaunng was seen after the appeal was denied and Barbar's family publicly called upon "Allah to avenge my injustice". We, the family of Babar Ahmad, have received today the news that the Home Secretary has decided to extradite Babar to the United States. This is a sad day for Britain and an even sadder day for British Muslims. In effect this sends a message to British Muslims that there is no "legal and democratic" means to air your concerns: you must use other ways to get justice. We utilised every "legal and democratic means" to fight this decision. We held protests, wrote letters, lobbied MPs and compiled petitions of over 15,000 signatures, some even from as far away as New Zealand; but all of this amounted to nothing to the Government. This did however, show the world how many people have come together bravely in the fight for justice. extradition are allowed to be opened, it will be British Muslims that will be targeted; the very people the British Government was hoping to win support from in "the fight against terrorism." O Allah, You have seen what they have done to me. O Allah, avenge my injustice. In Allah we put our trust." The family will be appealing against this prejudiced decision at the High Court. Our resolve remains firm in the fight for justice for Babar. Do you feel victimised or prejudiced against because you are Muslim? Do you feel your voice is not being heard? Do you want to be involved in representing Muslim concerns? Do you want to actively participate in helping the Muslim Community locally? At a recent community conference Luton Muslims unveiled draft proposals for a Muslim Community Liaisons Unit (MCLU)which would liaise with the police, local government, Luton Mosques and other agencies to combat the factors, which lead to hate crimes, unfair arrest and detainment of Muslims. A portfolio was made available elaborating how the MCLU will be dedicated to eliminating all forms of discrimination and intolerance against Muslims, countering the negative attitudes and prejudices that lead to harassment of local Muslims. Furthermore, the document emphasised the necessity of adopting a trilateral approach with respect to victimisation of the Muslim community covering Prevention, Support and Protection. Luton Muslims will be hosting a Public Meeting on Sunday 25th April to further practical steps to actualise these proposals. On Monday 13th April Luton Muslims hosted a community conference entitled "Time for Justice" at Bury Park community Centre, Luton. The conference was convened in light of growing tensions toward the Muslim Community locally and nationally. A mixed audience spanning both younger and older generations of the community with a number of local councillors and MPs supported the 2-hour event. The Media had strong representation at the conference with live hourly updates by BBC News 24 and extensive local coverage. Mr Azmat Begg initiated the proceedings with a vivid, moving description of the plight of his son Moazzam Begg, still held in Guantanamo Bay. In a passionate appeal to the hearts and minds he argued for the fundamental right to trial for all those held in similar conditions in the UK (Belmarsh and Woodhill) and abroad. Mr Abu Yusuf, a solicitor specialising in human rights proceeded to argue the case against the validity of current anti-terrorism legislation. Unravelling the contradictions within the legal processes that threaten the integrity of the Muslim Community he called upon the Community to voice their concerns collectively in order to prevent the compounding of these draconian measures. After a short break and refreshments the audience sat back to an enthralling multimedia presentation, courtesy of the organisation "Stop Police Terror", which focused on the Government's unrelenting "witch-hunt" within the Muslim Community, drawing on testimonies from many victims of police maltreatment and flawed judicial processes. The next presentation, delivered in Urdu and English by Imam Awan, Imam of Luton's Madina Mosque, asserted Islam's fundamental commitment to Justice and its opposition to all forms of oppression, drawing on examples from the Quran (God's divine revelation), the Example of the Prophet Muhammad (PBUH), and the testimony of Islamic History. Mr Qari Isma'il, a HM Inspector of Schools and lecturer at Birmingham Central Mosque, concluded the event with a powerful call aimed at mobilising the community towards engaging in positive work with the wider community and governmental bodies to counteract the negative stereotyping existing today. He drew on his own experience of work in this field and warned of the dangers of inaction. Concluding with a prayer for those still unjustly detained he emphasised the need to maintain a positive outlook. The conference saw the unveiling of draft proposals for a Muslim Community Liaisons Unit (MCLU), which would liaise with the police, local government, Luton Mosques and other agencies to combat the factors, which lead to hate crimes, unfair arrest and detainment. Luton Muslims would like to thank all those who participated in this event and would like to invite all those who wish to involve themselves in the Community Liaisons Unit to contact us on [email protected] or 07960595599. MIM: The website of the Luton Muslims includes articles which depict the 72 virgins in paradise and a description of hell which seems makes the idea of blowing oneself up and going to straight to paradise infinitely preferable then ending up hell. By couching the call to Jihad in religious terms, Muslims in Luton can feign ignorance that they might have contributed to their community's having been the launching pad of several suicide bombers. "...The righteous will die; And the wicked will die. The warriors who fight jihâd will die; And those who sit at home will die.."
"...So keep in mind the point of death, and of one's passing on to the next life, and the number of sins that one has committed and the small amount of good that one has done. Think of the good that you would earnestly like to do at that time - then bring that forward and do it today. And think of all those things which you would desire to clear yourself of- then clear yourself from them now..."
Death is a harsh and fearful reality faced by everyone who lives. No one has the power to avoid it, nor does anyone around a dying person have the ability to prevent it. It is something that happens every moment and is something encountered by the young and the old, the rich and the poor, the strong and the weak. They are all the same in that they have no plan, nor any means of escaping it, no means of intercession, no way to prevent it, nor to delay it. "Every soul shall taste death. And We shall make a trial of you with evil and with good, and to Us will you be returned." [Sûrah al-Anbiyâ 21:34-35]. Indeed it is death which causes fear in the souls, and with it one's actions are sealed, and what comes after is even more fearful and fear-inducing. For is there a place one can flee to in order to escape from the constrictions suffered in the grave? What will our reply be when we are questioned in the grave? Indeed, not a single one of us knows where we will end up. Will it be Paradise whose width is like the heavens and the earth, or shall it be the Fire whose fuel is of men and stones? You claim to love Allâh's Messenger(SAW); yet you abandon his Sunnah (guidance and way). The righteous will die; And the wicked will die. The warriors who fight jihâd will die; And those who sit at home will die. Those who busy themselves with correct beliefs will die; And those who treat people as their slaves will die. The brave who reject injustice will die; And the cowards who seek to cling to this vile life will die. The people of lofty-goals and ambitions will die; And the wretched who live for cheap enjoyment will die. "Every soul shall taste death." [Âl-'Imrân 3:185]. So keep in mind the point of death, and of one's passing on to the next life, and the number of sins that one has committed and the small amount of good that one has done. Think of the good that you would earnestly like to do at that time - then bring that forward and do it today. And think of all those things which you would desire to clear yourself of- then clear yourself from them now. MIM: One wonders if the London suicide bombers from Luton read their local community website description of paradise . It is not hard to imagine that the prospect of endless 'cohabtation' with virgins with renewable virginitymight have been a source of inspiration to carry out suicide bombings in the hope of getting to paradise (Jannah). This choice of paradise could be considered a "no brainer" seeing as that the description of hellfire on the Luton Muslim website includes such punishments as, having boiling water poured on one's head, eating food which induces choking due to thorns, and drinking water to stop the pain which then cuts the intestines'. "Whenever their skins have been done (burnt away) we replace them with new skins so that they may taste of the punishment" [an-Nisaa: 56]. Their food in the fire is Ad-Daree' (a thorny plant). "They call, Oh Maalik let your Lord destroy us" After many years he responds to them with two words "You are staying" [43:77]. He has therein a house and he knows this house as he knows his dwelling in this life. His house is made from bricks of gold and silver. In it he has wives from the Hoorul-'een. "They will see there neither the excessive heat of the sun nor the bitter cold." [Al-Insaan: 13]. "The bunches of fruit thereof hang low, within reach" [al-insaan: 14]. The Companions of our Prophet Muhammed (SAW) used to gather to remember death so that they would benefit their souls by increasing in fear of Allaah and strive to gain His pleasure. If this was the case of the Sahaabah and they were the best of generations, the most pious and God-fearing of this ummah, then what about us? Surely, it means that we need to engage in the remembrance of Allaah(SWT) even more. After all, we are in far more need of this act of worship than they were. They place him in his shroud, his leg joins his other leg. Then he is carried upon the shoulders and taken to a dark hole. If he was a transgressing criminal he cries out: "Woe to it! Where are you taking it?" This trangressor will remain in his grave alone, there will be no one to sit with him and no one to keep him company. He will feel the heat of the fire, smell its foul odour, and be tortured therein. This man's grave will squeeze in upon him so much so that the bones of his rib cage will cross each other. Despite all this punishment and all this torture and pain, he will hope that the hour will never be established. For this man knows that the hour is far worse and of he will be in greater loss on that Day. The man hears 'As-Saakhah' from within his grave, and what is 'As-Saakhah'? It is the second blowing of the trumpet. This is when all that is in the graves shall be raised and resurrected. The mother will come to her son and say: "Oh my son, my breast was a container for you, my womb was a container for you. Oh my son I seek from you a hasanah (merit) that I may approach Allaah with. My son, do not be greedy towards me". In the world this son would have sacrificed his life, rather many lives for merely the happinness of his mother so how does he treat her now? He responds to her plea: "Get away from me! Leave me! Indeed I am in need of this merit more than you." So mankind will wait in this crowding place for 50,000 years, after which Allaah, The Most Perfect and The Most High, will come to judge them. So He will call the criminal and say to him, "Oh so and so, did I not give you of the cold water to drink? did I not give you a healthy body? Did I not give you many bounties? What have you done with all that which I bestowed upon you?" So the man replies, "I have done nothing my Lord." So he lies to his Lord on that day. Allaah says: "Where are the witnesses!". So the Angels come and bear witness that this criminal did not pray in those moments of prayer, he drank, fornicated, lied, cursed and insulted. He turned away from belief and was proud and arrogant. So the criminal says to his Lord, "I do not acceptaccept a wintness except one from myself." His Lord replies to him, "And you have that?" Then Allaah will say, "Seize him and fetter him. Then throw him into the blazing fire. Then put a chain which is 70 cubits long through him. Indeed he did not used to believe in Allaah, The Most Perfect,The Most High." "Every time a nation enters it curses it sister nation" [Al-a'araaf: 38]. After all of this, they have one last chance and they call upon their Lord, "Oh our Lord we were indeed astray! Oh our Lord we were indeed misguided, we did fall short. Return us to the world so that we can do good instead of that which we used to do." Allaah replies to them, "Rot in it and do not speak to me. After this they do not speak nor do they utter." They are then called from afar, "Oh dwellers of the fire, do you know what this is?" They reply, "Yes that is death in the form of a ram." Death is then slaughtered in a place between Al-Jannah an An-Naar. It is said to the dwellers of the fire, ever-lasting life without death. When he is placed into his grave it is widened and made spacious for him. He smells the sweet fragrance of Al-jannah and feels some of its comforts. He sleeps in his grave like a bride on her wedding night who no-one shall awaken except her beloved. When the cry comes he is gathered to the crowding place and waits there for 50,000 years. This time passes as if it were the time between Zohar and Asr. Then the Lord of the worlds comes to make judgement, so He calls His slave saying, "Oh my slave, do you not remember that sin, do you not remember this sin." So the slave replies, "My Lord I have perished!" So Allaah replies to him, "I hid it in the world fo you and this day I forgive it." This good man is handed his book in his right hand. Due to his happiness he runs to the people and says "Take it; read my book. Indeed I used to think I would meet my accounting." So be the children of the Hereafter and not the children of this life; a party in Paradise and a party in the Hell-fire. This Hadith is a statement for the variation in degrees in the punishment of those in the Hell. We seek protection of Allah from it and from anything that leads to it whether word or deed. The punishment for those who had taken the Qur'aan and then ignored it and for the one who sleeps through the time of the prescribed prayer. Samurah bin Jundub narrated that Rasoolillah(SAW) said "...We came upon a man who was lying down, and another standing over him with a rock. He then hit him with the rock, split his head and the rock rolled away. So he followed the rock and retrieved it. When he returned to him his head had returned to how it was previously.The explanation came at the end of the hadeeth by the statement of the two angels to the Messenger of Allah (SAW): As for the first man that you came upon whose head was being split with a rock; this was a man who had taken the qur'aan and then ignored it, and had slept through the time of the prescribed prayers. In another narration, he said:....So this will continue to be done to him until the Day of Resurrection." We also find in the hadeeth of Samurah bin Jundub: "...We departed until we came upon another man who was lying flat on his back, while another stood over him with an iron hook. He approached the one who was miserable looking. He faced him and ripped open his mouth up to his neck, and his nose up to his neck, and his eye up to his neck. He then went over to the other side and did the same as he had done to the first side. He had hardly completed this side when the other sider eturned to its normal state. He then returned to it and did what he done the first time." At the end of the hadeeth he said: "...As for the man that you came upon who had his mouth ripped up to his neck, his nose ripped up to his neck, and his eyes ripped up to his neck; this was a man who used to leave his house, spreading lies and circulating them everywhere. In another narration it says: So this will continue to be done to him until the Day of Resurrection." The punishment of the adulterer and the adulteress. In the same hadeeth we also find mentioned: "...We departed until we came upon a clay lined pit. I think he said: There was much noise and clamour. We looked into it and saw naked men and women, and a flame was flaring from beneath them. Whenever that flame reached them, they screamed. The explanation about them came in the hadeeth: ...As for the naked men and women who were in the clay lined pit; they were men and women who committed adultery." The punishment for the one who consumes interest. The punishment for the one who does not protect himself from urine. The punishment is increased for the unbeliever because of the weeping of his family over him. The dead is punished because of lamentation over him. The dead is punished because of what some of his family say about him. The punishment for the one who used to carry tales. O Muslims! Achieving noble and lofty objectives require enormous sacrifices in proportion. There can be no doubt that the higher an objective is, the greater its sacrifice must be. Therefore, if ones ultimate objective is to please Allah and hope to be granted Paradise, then defending Allah's religion and protecting His Book and sacred places ranks highest in attempting to attain His pleasure. Firstly: By repeatedly declaring his deep love and fervent wish for Shahadah. Abu Hurayrah(RA) narrated that the Prophet(SAW) said: "I swear by the One in Whose Hands my soul is, I wish that I would fight for the sake of Allah (i.e., Jihad ) and get martyred, then return and fight again and get martyred, then return and fight again and get martyred" (Bukhari & Muslim) What a wonderful wish coming from the purest of hearts! This is nothing except a reflection of deep love and overwhelming desire; a desire to attain Shahadah, which is one of the greatest paths to Paradise. Secondly: By explaining the virtues of Shahadah and the ranks of the martyrs in Paradise as well as descriptions of their bounties, such as in the Hadeeth when Marwan said: "We asked 'Abdullah Ibn Mas'ud(RA) about the following verse: (which translates as): "And never think of those who have been killed in the cause of Allah as dead. Rather, they are alive with their Lord, receiving provision." (Aal-'Imran: 169). 'He(RA) replied: "We asked the Prophet(SAW) about this verse and he replied: "Their (i.e., the martyrs souls) will live inside green birds that dwell in designated lamps which hang on the throne of Allah, they will roam freely in Paradise as they please, then return to these lamps"" (Muslim). 1. He is forgiven at the first drop of his blood. 2. He sees his status in Jannah (Paradise). The pain that a martyr feels at the time of death will be reduced so greatly that he will only feel as if he was stung by a mosquito. Abu Hurayrah narrated that the Prophet(SAW) said: "A martyr only feels from the effect of being killed that which one would when being stung by a mosquito." (Tirmidhi, Nasa'i and others). Moreover, the finest dwellings in Paradise are those of the martyrs. Samurah Ibn Jundub(RA) narrated that the Prophet(SAW) said: "Last night I was inspired (through a dream); I saw two men come to me and take me up a tree (in Paradise) then into a dwelling which was the best I have ever seen; they informed me that it was the dwelling of the martyrs." (Bukhari). Also, the angels spread their wings over the body of a martyr as a form of honour, dignity and respect. Jabir Ibn 'Abdullah(RA) narrated: "My father's body was brought to the Prophet(SAW) on the day of Uhud. The disbelievers had mutilated it; I went to uncover his face when some of my family members stopped me. Then the Prophet(SAW) heard a woman crying, so he said:"Why are you crying? Do not cry, the angels are continuing to shade him"". "Nobody who enters Paradise would ever wish to return to this life again, even if he was to be given the whole world and everything in it - except for a martyr; for he would wish to return and get killed ten times due to the honour that he received (in Paradise)." and in another narration: "For what he finds as virtues of martyrdom." (Bukhari & Muslim). "The Prophet(SAW) took off with his companions and they beat the polytheists in reaching Badr. When the polytheists arrived there, the Prophet(SAW) said: "None of you should do anything until I proceed." Then, when the disbelievers came closer to them, the Prophet(SAW) said: "Rise to Paradise, which is as wide as the distance between the heavens and the earth." 'Umayr Ibn Al-Hamam(RA) asked: 'O Messenger of Allah, is it really as wide than the heavens and earth?' He(SAW) replied: "Yes." Thereupon 'Umayr said: 'Bakh Bakh.' (an expression reflecting astonishment). The Prophet(SAW) asked: "What made you say Bakh Bakh?" He said: 'Nothing, except the desire to be of its dwellers.' The Prophet(SAW) said: "You will be of its people." Then 'Umayr(RA) took out some dates which he had in his arrow pouch and started eating them, then he stopped and said to himself: 'Indeed it would a too long a life for me if I were to live long enough to finish eating these dates' - then he threw them away and fought until he was killed." Haraam Ibn Malhan(RA) was one of a group of companions of the Prophet(SAW) who had memorised the Qur'an and were experts in it. The Prophet(SAW) dispatched seventy of this group to inform a group of polytheist tribes about Islam and recite the Qur'an to them. However the tribes of Ra'l and Dhikwan from among these polytheist tribes betrayed and slaughtered the whole group of companions near a well called Ma'unah. As Haram(RA) was being killed, he screamed in front of his killer: "I swear by the Lord of Al-Ka'bah that I won! "After this, his killer went about asking people what these words meant (i.e., that Haram had won) until he was told that what Haram(RA) meant was that he had attained martyrdom. Due to this, the killer embraced Islam. This narration was mentioned in the book of Bukhari. Some of the companions of the Prophet(SAW) would smell the scent of Paradise and it would make them unable to control their desire to fight strongly and valiantly to the death. Anas Ibn Malik(RA) said: "My uncle Anas Ibn An-Nadhr(RA) missed the battle of Badr, so he said to the Prophet(SAW): 'O messenger of Allah, I missed the first battle that you fought against the polytheists, but if Allah allows me to participate in the next one, then He will see what I can do.' Then, after the day of the battle of Uhud when the some Muslims retreated he went forth saying: 'O Allah I seek your forgiveness for what they have done (i.e., the Muslims for retreating) and I disassociate myself from what those have done (i.e., the polytheists for killing the Muslims)', as he continued going forth, he came across Sa'd Ibn Mu'adh(RA) and said: 'O Sa'd! I swear by the Lord of the tribe of An-Nadhr, it is Paradise (i.e., the reward for martyrdom). I can smell its fragrance close to Uhud.'" After the battle, Sa'd Ibn Mu'adh told the Prophet(SAW): "I swear By Allah, on that day I could not perform as he did." Anas Ibn Malik(RA) continued: "(After the battle) we found more than eighty gashes on his (i.e., Anas Ibn An-Nadhr's) body which were the result of swords, arrows and spears. In fact, the polytheists had mutilated his body so much that nobody could recognise who it was, except his sister, who identified him from his fingers." (Bukhari & Muslim). Shaddad Ibn Al-Haad(RA) narrated: "A Bedouin came to the Prophet(SAW), accepted Islam and said: 'I wish to migrate (to Madinah)'. So the Prophet(SAW) asked some of his companions to take care of him. Then after a battle, the Muslims had gained some booty so the Prophet(SAW) divided it and gave the Bedouin's share to some of his companions to look after, as the Bedouin was still at the rearguard. When the Bedouin returned, they gave him his share, so he asked them: 'What is this?' they replied: 'It is your share from the booty which the Prophet(SAW) gave us to hold on to for you.' So the Bedouin took the booty and went to the Prophet(SAW) and asked: 'What is this?' The Prophet(SAW) replied: "Your share of the booty." The Bedouin said: 'This is not why I believe in you and follow you; rather, I follow you so that I can get shot by an arrow right here, (and then he pointed to his throat) then die and enter Paradise.' The Prophet(SAW) said: "If you are sincere then Allah will grant you your wish. "After a short while, fighting resumed and the Bedouins body was brought to the Prophet(SAW) with an arrow in his throat at exactly the spot where he had pointed to the Prophet(SAW). Thereupon The Prophet(SAW) said: "He was sincere so Allah granted him his wish." Then using his own garment, the Prophet(SAW) shrouded the Bedouin, prayed the funeral prayer over him and was heard by his companions to say during the prayer: "O Allah! This is Your slave who migrated for Your sake and was killed as a martyr - and I testify to this". Which testimony could ever be more honourable, sincere and truthful than this great one given by the Prophet(SAW)? There are abundant examples from the lives of the companions of Prophet(SAW) which illustrate their burning desire to achieve martyrdom - and what a noble objective this is! Today we Muslims and indeed the entire world can witness the greatness of martyrdom being illustrated in the uprising of Palestine in general and Al-Aqsa in particular. This kind of stance, which revives the magnitude and virtues of martyrdom in the heart of the Muslim nation, is exactly what we need at this time. It is vital that the Muslims exert every effort to spread the love for achieving martyrdom just like the pious early generations of Muslims did. We must continue on the same road that they were on, which is that of our Prophet(SAW) and indeed all the prophets before him, in order to support our religion and defeat our enemies. O Muslims around the world! It is obligatory on you to support your brothers and sisters in every country where they are oppressed. Do not forsake them, rather listen to the saying of your Prophet(SAW): "Any Muslim who forsakes his fellow Muslim at a time when his honour and sanctity are being attacked will have Allah forsaking him at the time when needs His support the most. Any Muslim who supports his fellow Muslim at a time when his honour and sanctity are being attacked will have Allah supporting him at the time when needs His support the most." (Ahmad & Abu Dawud). "Indeed, Allah has purchased from the believers their lives and their properties [in exchange] for that they will have Paradise. They fight in the cause of Allah, so they kill and are killed. [It is] a true promise [binding] upon Him in the Torah and the Gospel and the Qur'aan. And who is truer to his covenant than Allah? So rejoice in your transaction which you have contracted. And it is that which is the great attainment." (Surah At-Tawbah: Ayah 111).